My sweet Maddie on her favorite pillow. This story is hard for me to write since it’s intensely personal. I’m sharing it so that anyone who has truly loved and lost a cherished pet knows that someone else understands their grief and sorrow — so they can see there is finally light at the end of a tunnel of despair — so they know there are ways to honor the life and memory of their treasured pet. It’s been said that the smallest of God’s beings have the biggest impact on our lives and leave the biggest holes in our hearts when they die. 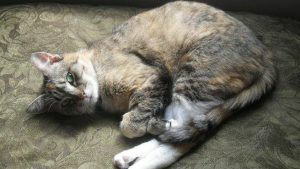 And so it was with my little girl Maddie — a six-pound ball of feline fur who profoundly changed me, through her life and her death. I can remember the day I met eight-year-old Maddie at the SPCA shelter. The first thing that struck me was her beautiful green eyes. I saw her sweet trusting nature when she rolled over to show me her tummy and gently grasped my hands with her paws. How could anyone have thrown this innocent soul away like so much garbage? I knew I had to take her home. Maddie fit in magically with our four-legged menagerie. She always sat protectively beside her 19 year old dog-sister Meggie as I put in Meg’s eye drops. She transformed her 12 year old cat-sister Katie from a diva that ruled the roost to a mellow, playful partner-in-crime. She held her own with her big cat-brother Harley, who didn’t dare pull a kung fu move on her. Maddie enchanted and amazed everyone who met her – from her love of playing hide-and-go-seek and tag to her incredible prowess fetching plastic balls. She’d be at the door to greet you with kisses, whether you’d been gone five hours or five minutes. Her eyes constantly twinkled with mischief and you knew she was planning her next escapade. Even on the worst days, Maddie made you smile and laugh, earning her the nickname ‘Cuckoo Bean’. She found joy in the simplest things and gave it back 10-fold. The most active of our kitties, Maddie never had a sick moment during the two years we had her. So when she fussed in the early am hours one Sunday and didn’t eat that day, we thought she just had a tummy-ache and took her to the vet first thing Monday morning. Blood tests showed a likely infection and elevated kidney levels. She stayed at the vet for two days receiving antibiotics and IV fluids to correct the problem. Only, it didn’t get corrected. We were told that she was in acute kidney failure and the kindest thing we could do is to put her to sleep. I remember screaming: “No, this can’t be! What are you telling me?” I was in shock. The bottom had just dropped out of my world. We brought Maddie home one last time, so she could be put to sleep in the place she had grown to love. She was so glad to be home. She spent the day lying on her favourite pillow and I lay on the floor beside her, telling her how much I loved her, and not to be afraid. I told her how sorry I was that I couldn’t save her. I made my baby a promise — that every night I’ll look up at the stars and say goodnight to her. Her tail never stopped wagging. Then the doorbell rang and it was time. We held her lovingly in our arms and suddenly my baby was gone. It hit me that this was the last time I’d ever hold my sweet Maddie. I didn’t want to let go. Our pets have always been our children and I loved and grieved each of them deeply. But Maddie stole my heart more than any other. Her unexpected sudden death devastated me more than any other. Perhaps it was the irony — Maddie’s adventurous spirit caused me to protect her at every turn — whether ensuring the toilet lid was up so she wouldn’t fall in or that string never fell to the floor. Yet, I failed her when she needed me most. Perhaps it was the self-doubt and regret — “If we had taken her to Emergency 12 hours earlier, she might have been saved” ran through my mind. It haunts me that I will never know. The months after her death were the hardest of my life. The pain and grief swallowed me; it seemed my spirit died with her. I sobbed non-stop and went through life’s motions in a daze. I couldn’t sleep and didn’t want to eat. Her last moments replayed in my head a thousand times. Our other pets were here but the house just wasn’t the same. Friends tried to comfort me, but I just wanted to be alone. I felt so lucky to have met Maddie and so honored to be her mom, but I couldn’t help feeling that she was cheated, that I was cheated, out of the wonderful future we deserved to enjoy together. Finding a personal way to say goodbye was very important. We had Maddie cremated and to commemorate her life, we held a memorial service for her. Her ashes sit among those of our other pets. I made a scrapbook with photos and stories of cherished moments with her. I saved the toys that were dearest to her and keep her favorite ball next to me each evening where we used to watch television together. I refocused love and attention on our other pets, who clearly missed Maddie’s presence. To help me move through my grief, I leaned on a good friend who understood my feelings, read books on pet loss and spoke with a counselor. Some people may think that Maddie was “just a cat, get another one.” But she was so much more to me. She was my baby, my child. Only those who truly love their pets understand the depth of our relationships with them. Only they appreciate that we mourn them as we would any beloved family member who dies. We need to give ourselves permission to grieve in order to heal. We need to seek out those people who will understand and respect our grief. Two years later, I still mourn her death. I still wish it wasn’t true. I try not to remember the pain of that fateful day and focus instead on the wonderful times we had together. I try to remember that Maddie’s life was so much more than her death, but it’s hard. I’ll never stop missing her. She was such a huge presence in our life. But would I give up the short time of unconditional love and absolute joy I had with Maddie because of the heartache of losing her? Never. We need to be grateful for the love our pets give us for whatever time they’re here. They teach us important lessons — to love unselfishly, to live each day to the fullest. We need to remember the good times, because remembering heals, remembering honors. My biggest breakthrough came when I shifted my focus from mourning Maddie’s death to honoring her life. I wanted to take the gift of love she gave me and extend it to other deserving animals. I already volunteered at the NS SPCA, but I stepped up my volunteering. I’ve always donated yearly to the SPCA, but I made a special donation in Maddie’s memory. I also made a bequest to the SPCA in my will so Maddie’s legacy will live on. I became a much stronger animal advocate, participating in campaigns aimed at preventing animal cruelty. I also started writing these articles to give a voice to those who cannot speak for themselves. I believe that Maddie and I will be together again one day. Meanwhile, I feel her spirit close to me, inspiring me to do more, to be more. Love never dies. Good night, Cuckoo Bean. Momma loves you. Judy Layne lives in Hackett’s Cove with her husband and their two adopted pets. A lifelong animal lover, Judy is a volunteer with the NS SPCA.